Jamaica Blue Mountain "Wallenford Estate"
At the eastern end of the island of Jamaica, the Grand Ridge of the Blue Mountains runs east to west and soars to a height of 7,402 feet. On the cool and misty slopes of the Blue Mountains beans of rare quality and aroma grow on steep hillsides and are processed at the historic Wallenford mill. For over a hundred years, Jamaican Blue Mountain coffee has been the world’s most prized coffee, fetching the highest prices. It is a coffee of rich flavour and aroma, full body and moderate acidity. And, it is deemed by the coffee experts of the world to possess all characteristics in perfect balance in the cup. 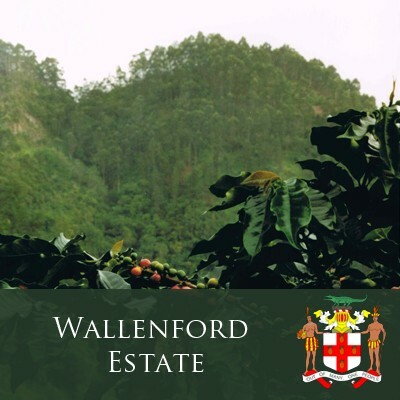 The Wallenford Estate coffee is distinguished by fruit in the nose and is brighter in the cup than the Clifton Mount, which we also offer. It is so well-balanced that even those of us used to adulterating our coffee with sugar or milk will find that this coffee is supremely smooth when black. Available in both Medium and Dark Roasts. For over a hundred years, Jamaican Blue Mountain coffee has been the world’s most prized coffee, fetching the highest prices. It is a coffee of rich flavour and aroma, full body and moderate acidity. And, it is deemed by the coffee experts of the world to possess all characteristics in perfect balance in the cup. At the eastern end of the island of Jamaica, the Grand Ridge of the Blue Mountains runs east to west and soars to a height of 7,402 feet. On the cool and misty slopes of the Blue Mountains beans of rare quality and aroma grow on steep hillsides and are processed at the historic Wallenford mill. For those who are interested, Jamaican Blue Mountain coffee has the lowest caffeine content.